Since 1981 we’ve specialized in creating custom Christmas ornaments, and we’d love to help you get the perfect ornament for your special event! If this is your first time visiting, we invite you to start by clicking around on our ornament pages (above) to see examples of our past work and to learn what options are available to you. We sell in bulk (wholesale) in order to get you the best price. Please note that for most ornaments the minimum quantity is 50. If you already have an idea of what you’d like (or even if you don’t), feel free to visit our Contact Us page to call or e-mail us directly. On this page you will learn how the order process works, and we have specific links for each type of our ornaments to get started. We offer very detailed & realistic Virtual Mockups for all customers at no cost as we design your custom ornament. We will revise them as needed until you are satisfied with the end result! We’ve helped schools, churches, military groups, corporations, historic preservation groups, booster clubs, military units, weddings, and every manner of civic organization create unique custom ornaments as gifts, fundraising items, or products for gift shops. We know that you’ll be satisfied with the superior quality and attention to detail that we offer with our acrylic (shatterproof), brass, ceramic, crystal, glass, pewter, and porcelain ornaments. 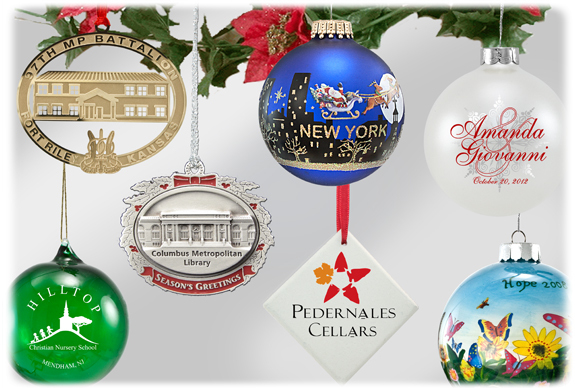 Don’t hesitate to contact us with any bulk or wholesale personalized ornament orders.